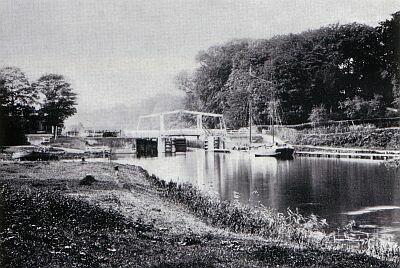 The KANAL was built in 1886 by the Flensburger Schiffsbau Gesellschaft under no. 85 on a joint order by the Flensburg-Ekensunder Dampfschiffahrtsgesellschaft and the Sonderburger Dampfschiffahrts Actien-Gesellschaft (DETHLEFSEN et al., 2000), both with headquaters in Flensburg, Germany. The coastal towns of Ekensund (danish: Egensund) located at northern shore of the Flensburg fjord and Sonderburg (danish: Sønderborg) at that time (1864-1919) were part of the German Empire. She had a length of 28.9 m between the perpendiculars, a LOA of 30,4 m, a beam of 7.1 m and was measured with 264 tons gross (BRT 182, NRT 88). Her 2-cylinder compound engine was indicated with 220 HP and gave her a top-speed of 8 kn. She was designed as a shelterdecker with a real freeboard of only 0.2 m. Unusual for her time, she was equipped with an electricity generator. Her interior arrangements must have been rather spartanic. 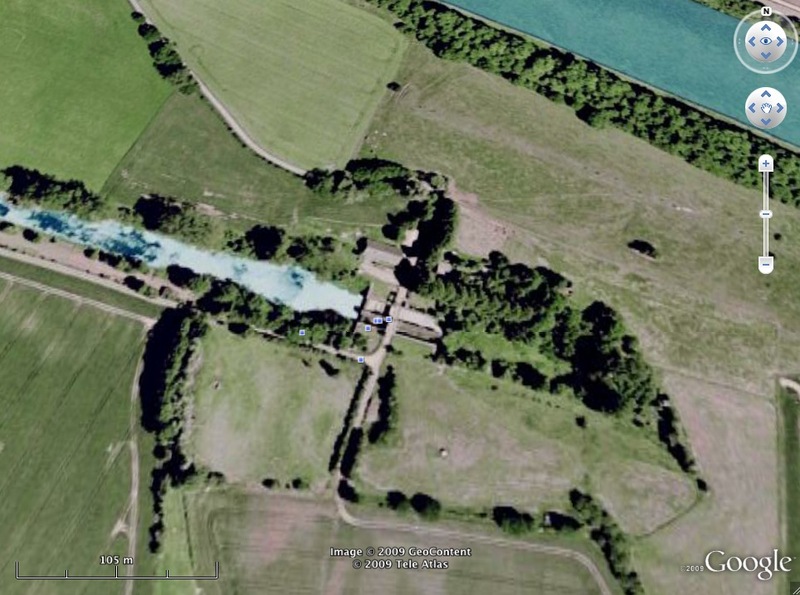 It appears that the accomodation for the captain, mate and engineer was aft in the deckshouse, while the stoker and deckhands had to make do with a small foc'sle. 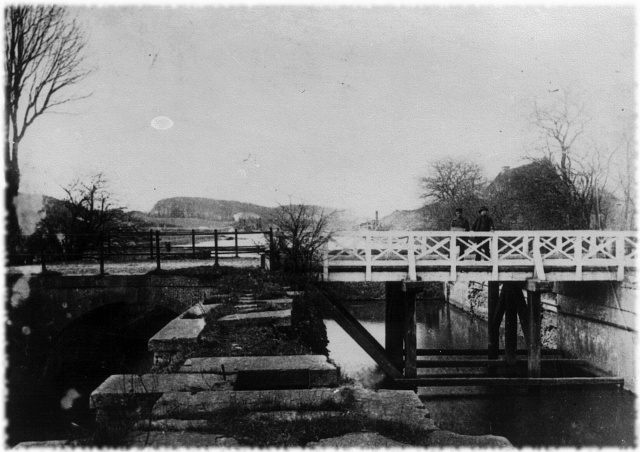 There was no wheelhouse on the bridge - seamen even on steamships had to be hardy people up to the end of the 19th century. 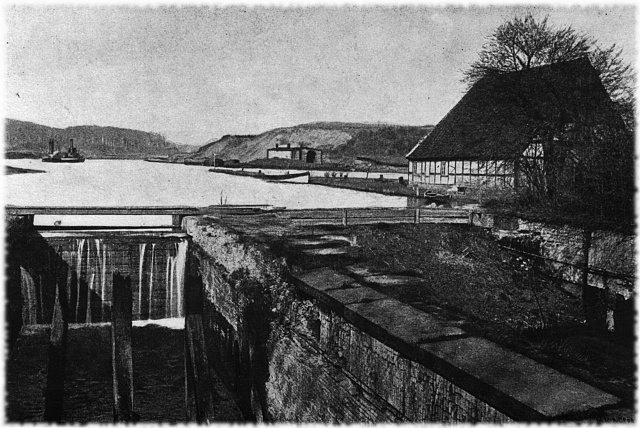 Her dimension were chosen to fit the locks of the Eider-Canal, the predecessor of the current Kiel-Canal (originally Kaiser-Wilhelm-Kanal and now Nord-Ostsee-Kanal for Germans), as she was intended for a regular service between Flensburg and Hamburg. 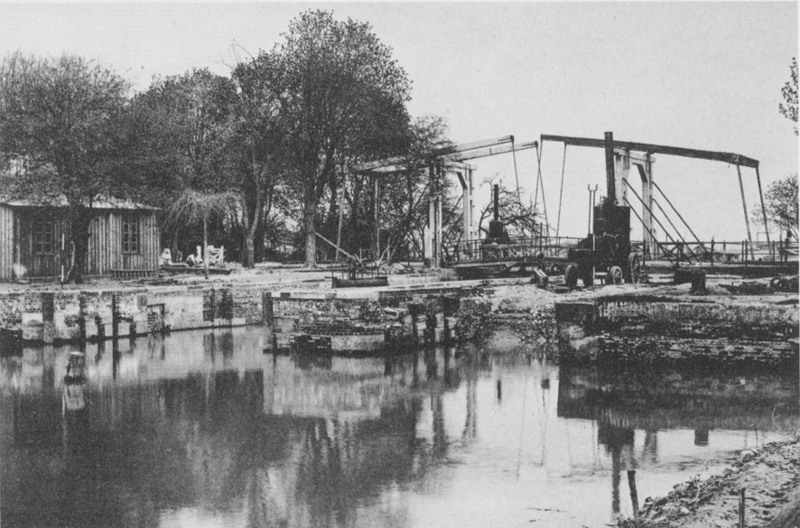 When the Kaiser-Wilhelm-Kanal replaced the old Eider-Kanal in 1895, the two companies that had in the meantime merged into the Vereinigte Flensburg-Ekensunder und Sonderburger Dampfschiff-Gesesllschaft decided to replace KANAL with a bigger KANAL II. 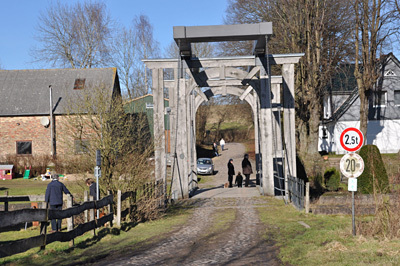 In consequence KANAL was taken out of the regular service and used as a cattle transporter. This trade together with her stumpy appearance led to her being nicknamed 'sausage kettle'. When built she received the class BV: I 3/3 P 1.1 by the Bureau Veritas. 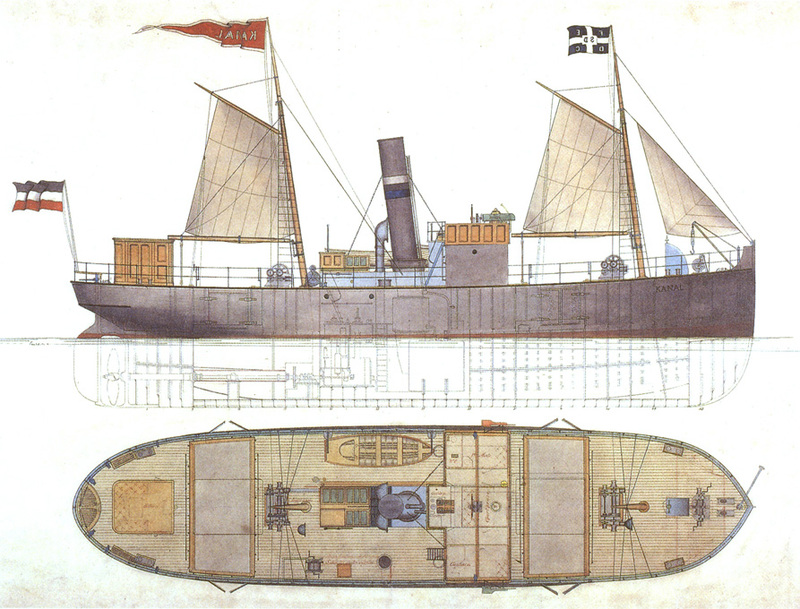 In 1897 she was re-classified with the Germanische Lloyd with the highest class for coastal shipping of 100 A 4 k. In 1906 the classification was not renewed because the owners did not want to renew her main deck, but was still surveyed by the German Marine Health & Safety Executive (Seeberufsgenossenschaft), who insisted in 'major repairs' shortly before her final accident (HARTMANN, 2009). It appears that the owners tried to avoid major investments into the little ship that may have become not such a profitable asset anymore by this time. On 22 December 1909 KANAL encountered a heavy snowstorm in the Ærøsound. When captain Blandt changed course to try to seek refuge in Ærø, the load of 159 cattle started to panic and shift, when she began to list in the heavy seas due to her main deck being flooded. Due to the heavy seas some of the crew (captain, 1st mate, stoker, two deckhands, and a boy) were washed overboard and she eventually sank. The steamer PHÖNIX of the same owners was able to rescue three of her crew, but one died later. The steamer KANAL I, homeport Flensburg, which yesterday morning at around 9 am departed from Kolding with 159 cattle for the quarantine station in Aabenraa, when leaving yesterday afternoon at 3 pm the Aarøsund, capsized and went to the bottom with crew and cattle. The crew consisted so far as is known by 8 men. ACCIDENT in the Little Belt: Aabenraa. 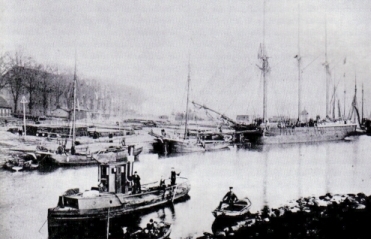 The KANAL I had 159 cattle on board for quarantine station in Flensburg. The ship, together with steamer KÖNIG, which had 105 cattle on board for Aabenraa, after passing the Aarøsund and entering more open waters, encountered by very rough seas. The ship rolled heavily thereby braking the ropes with which the cattle were tethered. The cattle went over to one side, causing the ship to heel over and sink. Of the crew drowned captain Bladt from Als, mate Jens Møller from Strandhuse near Kolding, engineer Gross from Aabenraa, stoker Wiese also from Aabenraa, and able seaman Christian Nielsen from Brøndsted. Rescued were able seaman Petersen from Kolding and ordinary seaman Andr. Andressen from Aabenraa. Only the body of the mate could be recovered. Since humans settled in Schleswig-Holstein and built boats they traversed the peninsula along the rivers of Eider and Treene, portaging their light boats at several places. During the Viking-Age it was a well-established crossing that avoided the troubled waters around the Skagerak when one wanted to go from the Baltic to the North Sea or vice versa. 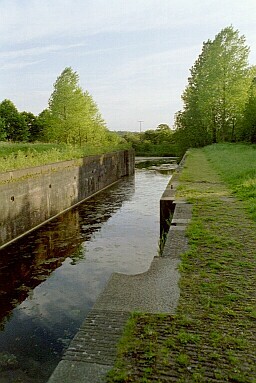 Plans to connect the rivers by short canals, thus avoiding the arduous land crossings existed for centuries and there were a few failed attempts. 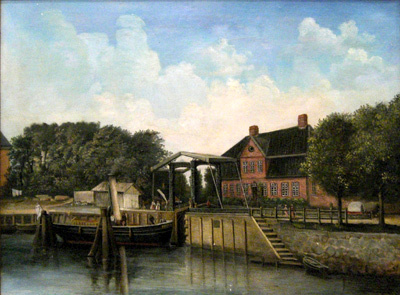 Finally, the government in Copenhagen decided to foster commerce by supporting the building of a canal between 1777-1784. 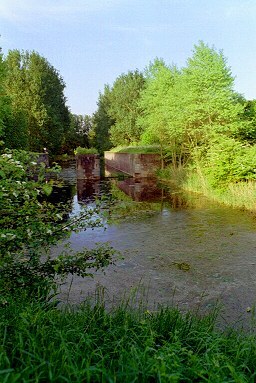 This canal went through several stages of development and rebuilding before being superseded and partly destroyed by the construction of the Kiel-Kanal that was opened in 1895. The Canal-Verein (Canal Association) was founded some years ago to protect the last remaining traces of the old Eider-Canal and to keep its memory awake. Still to come ... it is planned to construct a waterline-model in the 1/160 set in a scene with a lock. It was originally foreseen to base the model on the GA drawing as reproduced on a card-model kit sold by the Deutsche Schiffahrtsmuseum Bremerhaven. However, it is understood that a plan developed for shipmodellers by W. Bohlayer will be released in the near future. 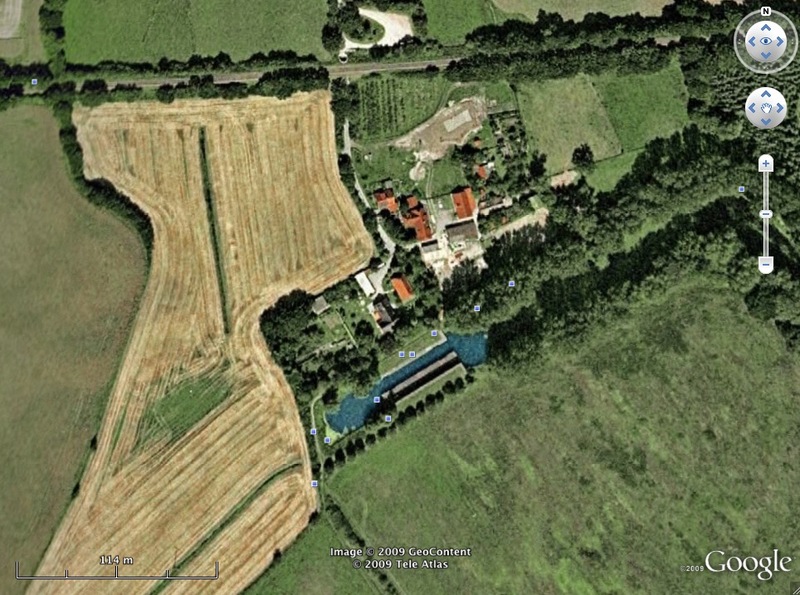 This plan is also based on the original GA as reproduced above. DETLEFSEN, G.U. (1982): Flensburger Schiffbaugesellschaft, 1872-1982 . 110 Jahre Schiffbau in Flensburg.- 118 p., Hamburg (Verlag Karl-Heinz Butziger). DETLEFSEN, G.U. (1983): Flensburger Schiffahrt – Vom Raddampfer zum Kühlschiff.- 160 p., Hamburg (Christian & Reim Verlag). DETLEFSEN, G.U. 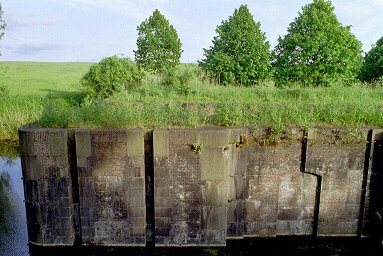 (1983): Eiderkanal gab Flensburger Dampfern seinen Namen.- Mitteilungen des Canal-Vereins, 4: 121-126, Rendsburg. DETLEFSEN, G.U., MOLTSEN, G., SCHNEIDER, A. (2000): Vom Dampfboot zum Katamaran. Die Geschichte der Flensburg-Ekensunder Dampfschiffahrts-Gesellschaft, aller ihrer Nachfolge- und Tochterunternehmen.- 272 p., Bremen (H. M. Hauschild GmbH). FLENSBURGER SCHIFFBAU-GESELLSCHAFT (1908): Titel ? Auflistung alle in Flensburg gebauten Schiffe und 20 Photographien.- Flensburg (Flensburger Schiffbau-Gesellschaft). FLENSBURGER SCHIFFBAU-GESELLSCHAFT (1951): 75 Jahre Flensburger Schiffbau – Gesellschaft.- 144 p., Flensburg (Verlag Emil Schmidt Söhne). FLENSBURGER SCHIFFBAU-GESELLSCHAFT (1962): Neunzig Jahre im Dienste des Schiffbaus.- 51 p., Flensburg (Hoppenstedts Wirtschaftsarchiv GmbH). FLENSBURGER SCHIFFBAU-GESELLSCHAFT (1971): 100 Jahre Flensburger Schiffsbau-Gesellschaft.- 60 p., Darmstadt (Hoppenstedts Wirtschaftsarchiv). HARTMANN, J. 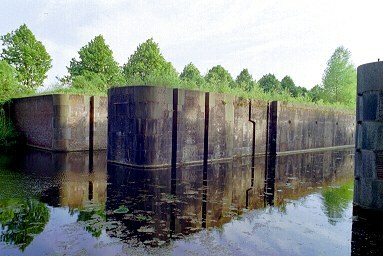 (2009): Der Dampfer "Kanal" von 1886. Das Schiff und seine letzte Reise.- 22 p., http://www.jan-w-hartmann.de/2009/Kanal_gesamt_2009-10-10.pdf (accessed 26.11.12). SCHARNWEBER, W. (2011): Die Kanäle Schleswig-Holsteins in Vergangenheit und Gegenwart. Entdecken – Erkunden – Erwandern.- 224 p., (Edition Temmen). 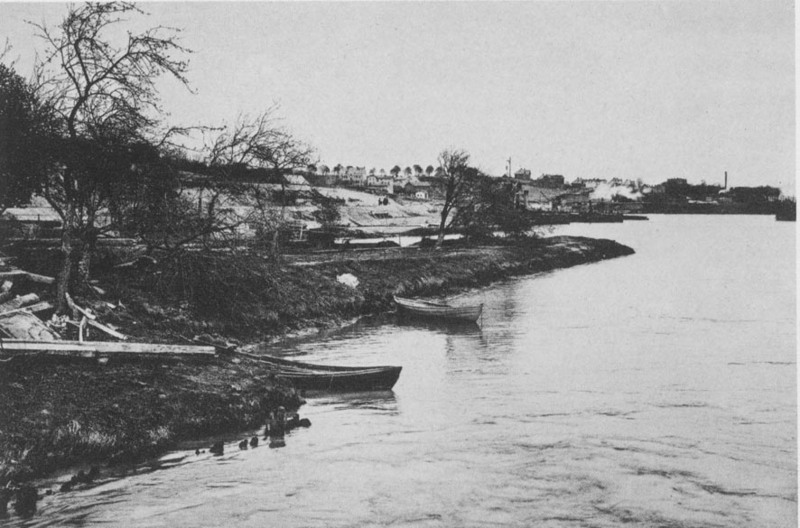 STOLZ, G. (1983): Der alte Eiderkanal - Schleswig-Holsteinischer Kanal.- 87 p., Heide/Holstein (Westholtein. Verlagsanst. Boyens & Co.). STOLZ, G. (1995): Kleine Kanalgeschichte – Vom Stecknitzkanal zum Nord-Ostsee-Kanal.- 9? p., Heide/ Holstein (Westholtein. Verlagsanst. Boyens & Co.).